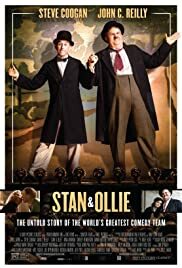 STAN & OLLIE (or perhaps alternatively called LAUREL & HARDY) is a capsule biographical film of the two of the world’s most famous comedians and a tale of undying friendship. The film is a biographical comedy-drama film directed by Jon S. Baird (from TV films and a few obscure theatrical films) from a screenplay by Jeff Pope. The comedy is derived mainly from their acts on stage and Laurel’s s often smart mouths remarks while the drama is the story of their friendship and Oliver’s illness). Based on the lives of the comedy double act Laurel and Hardy, the film stars Steve Coogan and John C. Reilly as Stan Laurel and Oliver Hardy. It already premiered in October 2018 at the BFI London Film Festival. The film had a limited release in the United States on 28 December 2018 and will be released widely in the United Kingdom, the United States and in Canada in January 2019. The film is boosted by two outstanding performances. Besides being impressionists, the actors have to act as well. 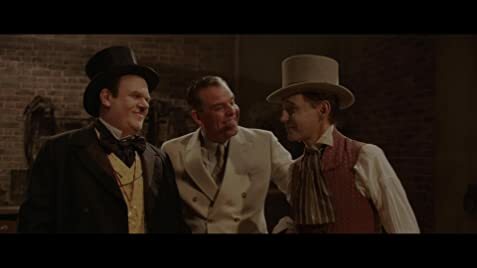 Both Coogan and Reilly enable audiences to forget who they really are but for their characters of Stan & Ollie. It is a tough decision to see who does the better job. Being American, Reilly earned a Golden Globe nomination for Best Actor (the Golden Globe is more American than foreign press) while Brit Coogan got snubbed. The other way around for the BFTA (British awards) where Coogan was nominated for the Best Actor award with Reilly up for nothing. The film is a U.K. co-prodcution as most of the film is set in the U.K. The film begins with the duo embarking on a gruelling music hall tour of the United Kingdom and Ireland during 1953, and struggle to get another film made – their own (comedy) version of Robin Hood. There is stop during the tour in Newcastle, though no-one during those segments speak with any Geordie accent. The film’s narrative is choppy (the script picks up a few incidents in the duo’s lives that mostly affected their bonding) punctuated by the duo’s acts on stage with the dramatic set-pieces. These acts are at least well performed. The audience get to see their best acts performed by the impressionists, which shows both how good the acts are and how good the impressionists are as were the original performers. The film gets a bit sentimental at times, especially in the last scenes where Ollie is ill from poor health. But the film’s two best segments are the dramatic confrontation where their friendship is tested and the comedy act where the two are supposed to meet by a change room but fail to see each other. The shooting of the last performance on stage – the dance number routine by Stan & Ollie must also be commended. The use of shadows, camera angles and editing to emphasize the talent of the duo is expertly done and watching the sequence is well worth the price of the admission ticket. The film ends appropriately with the epilogue that Ollie’s health deteriorated after the tour, leading to his death in 1957 and Stan’s eight years later in 1965. Stan continued to write sketches for Laurel and Hardy in the last eight years of his life.